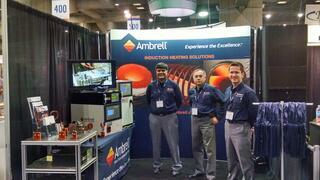 Ambrell will exhibit at the Montreal Manufacturing Technology Show for the first time next week. The show runs May 16-18 at Place Bonaventure in downtown Montreal and Ambrell will exhibit in booth 261. MMTS is Quebec's largest manufacturing event drawing over 4,500 attendees. Specializations include metalworking, additive manufacturing, automation, tooling and more. At the booth, attendees can see induction heating in action and learn more about Ambrell's complimentary applications testing from THE LAB. Dr. Girish Dahake, Senior Vice President, Global Applications, will be at the show to discuss applications. It's a great opportunity to discuss your application with an industry guru and get the free applications testing process started. If you visit the booth and mention this blog post, you'll receive a free remote device charger -- ideal for when you're away from a power outlet.